Source-Omega, the makers of SOURCE OIL® since 2012, forwarded they still make the freshest, most stable, best tasting, unblended algae omega-3 oil on the market. The product was perfected 6 years ago, they say, and it remains perfected because it is water extracted, winterized and a single ingredient oil. Previous company statements in press, since 2012, have been forwarded by Source-Omega and its Chief Scientist. These statements include comments that suggest algae oil is successful as an unmodified, natural food for nutrition, that algae omega-3 can substitute for medical fish oils, that retro-conversion of DHA is more efficient than taking high EPA levels since the body own ratio is about 80% DHA and only 5% EPA, and that their oil is made in controlled tanks and is untouched by seawater. Dr Scott Doughman, the founder and architect of Source-Omega, says "Our Chromista oil (schizochytrium sp.) is uniquely water extracted to create an improved quality standard. We consistently have the lowest Total Oxidation number in an algae oil ever recorded. Our latest 3rd party certificate is available to view." The lowest oxidation score means the taste and freshness are unmatched, Dr Doughman suggested. He further claimed that adding additional antioxidants post-extraction is "totally" unnecessary or can even "backfire" when in excess. He says this often turns into a formulation race to recover errors that get propagated in the name of so-called improvements. He suggested this is because each ingredient mix has different unknowns, contaminants and drawbacks, which can spiral into formulation fixes and lower quality and off tastes. "Although new algae oil suppliers may enter the algae oil market, it appears superior taste and quality will remain exclusive to SOURCE OIL, the only 100% algae oil product on the market. My 10 years of experience with algae oil and my training as a NIH omega-3 lipid biochemist ensures that our standard is our promise. Source-Omega is advising not to formulate with pigments and fillers because it will lower the quality. Pure organic flavor oils such as lemon, orange and rosemary oils that are rich in terpenes have proven the best flavoring options." Tagged as Chromista, DHA Algae Oil, EPA Fish Oil, Fresh Taste, Vegan Omega-3, Water Extracted. 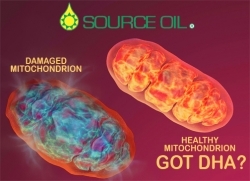 Source-Omega (www.source-omega.com) today asserts the newest DHA omega-3 structure-function claim filed with the FDA to demonstrate how their exclusive product, SOURCE OIL® - Water Extracted Chromista Oil - best supports mitochondrial health and maintenance. SOURCE OIL is the first and only 50% DHA algae oil that is also the first and only water extracted algae oil offering the highest quality, purity and potency. Source-Omega's own publication reviews support 1200 mg DHA per day for 90 days as an average ideal intake level. Accretion is the act of building-up stores or reserves in the form of higher DHA levels over time, yet accretion is naturally limited to an average ideal level of about 8% total omega-3 membrane composition, thus posing no risk of overdose or side effects. Most people persist at about 4% total omega-3 membrane levels and have very little, if any, DHA in their mitochondrial cardiolipin. Dr Scott Doughman, PhD, the Founder and Chief Scientific Officer of Source-Omega said, "The summary of 16 clinical studies using algae DHA proves tissue accretion therapy is effective and supports longevity. By using an average 1200mg DHA per day, within the range of 700 mg DHA to 1500 mg DHA per day, a person will double total omega-3s in their red blood cells in 90 days and in all cells within 12 months. But now we observe studies with similar intake levels that support DHA accretion in mitochondrial cardiolipin within the same time periods." What is a permitted structure-function statement? The FDA (www.fda.gov) states that "Dietary supplement labels or labeling may bear statements that describe the role of a nutrient or dietary ingredient intended to affect the structure or function in humans or that characterize the documented mechanism by which a nutrient or dietary ingredient acts to maintain such structure or function, provided that such statements are not disease claims." Claims and general substantiations for the DHA brand SOURCE OIL are that it is an ingredient used in consumer finished products. All labels and labeling associated with SOURCE OIL contains the following statement: This statement has not been evaluated by the Food and Drug Administration. This product is not intended to diagnose, treat, cure, or prevent any disease. The Source-Omega company has previously defined uses for DHA-rich algae oil in the the structure-function and formation of very low-density lipoproteins (VLDL) in the liver as the first act of DHA in the body, before it is deposited into cell membranes phospholipids and the mitochondria. Their earlier work on VLDL biology demonstrated how precious DHA is in the liver, describing how the liver uses DHA selectively to move dietary fat and to transport it efficiently. The mechanisms described imply that DHA functions directly in maintaining normal plasma triglycerides levels and normal fatty liver levels. Source-Omega, LLC is the leading Chromista algae oil innovations company since 2007 serving the public health using a unique water extraction process, lowering prices and improving quality. Preformed DHA has also been defined in Source-Omega's publications to be safe and effective for adults at 1200 mg DHA/day. The company defined 1200 mg DHA/day as a best practice for adults and showed how the liver can rapidly make EPA from DHA in just the right amounts (Doughman et al., 2013). Tagged as DHA Algae Oil, Mitochondria, Omega-3 Benefits, Vegan Omega-3. Source-Omega discloses astounding commercial R&D results with pure Chromista water extracted algae oil. With first and only claims such as the first water extracted algae oil, the first single ingredient 100% algae oil (Schizochytrium sp. ), the first 50% DHA oil standard, Source-Omega scientists have developed the first Chromista oil DHA (docosahexaenoic acid) plus CBD (cannabidiol) product, launched in California in early March 2018. "Demand driven R&D proved to us that this oil was the best emulsifier of CBD oil preparations, from raw CBD oil to pure CBD isolate, achieving a 33% CBD concentrate at room temperature and a 50% CBD concentrate at only 45 degrees Celcius as stable, clear, fully emulsified solutions. The length and unsaturation of the lipids in our oil may be the most powerful natural oil emulsifier of CBD powders and pastes," said Scott Doughman, PhD, Chief Scientific Officer, CEO and Founder of Source-Omega, LLC. Doughman said recent events foretell of the "the word getting out" and "boom demand" for the Chromista oil DHA. He disclosed 3rd party product developers are reaching the same astonishing conclusions about CBD emulsification with the DHA oil, stating that solid CBD decarboxylated oil concentrates in 1 gram "chunks" will dissolve, i.e. fully emulsify, into the Chromista oil simply by sitting overnight without heating, sonicating or mixing. The premium DHA oil contains an average chain-length of 20 carbons, whereas olive oil's average chain-length is about 18 carbons, coconut oil's average is about 16 carbons and medium chain triglyceride (MCT) oil's average is about 10 carbons. DHA in fish oil and krill oil comes from algae oil in the food chain. DHA is commonly used in food supplements because DHA is the most abundant omega-3 in the human body, brain and organs by ten-fold, with a maximum ratio of 97% DHA in the brain. Recent interest in DHA has focused on two new endogenous wellness pathways; a) DHA-cardiolipin structure and function in the mitochondria, as DHA is the only omega-3 used by mitochondrial cardiolipin and only when DHA is sufficiently and consistently present in the diet, and b) DHA supplementation also appears to increase Synaptamide production in the brain. In neurons, DHA can be directly converted into Synaptamide (Docosahexaenoylethanolamide), a structural analog of the endogenous cannabinoid receptor ligand anandamide, made from Arachidonic Acid. Synaptamide is synthesized from DHA in the brain, although it binds weakly to cannabinoid receptors, it independently stimulates growth, synaptogenesis and synaptic activity in developing hippocampal neurons at nano-molar concentrations. The term Synaptamide was coined to describe its activity and molecular similarity to anandamide. Tagged as Algae Omega-3, Cannabidiol, CBD, Emulsification, Vegetarian Omega-3. Mason, OH, July 25, 2016 --(PR.com)-- Source-Omega today reiterated its active structure function claims in lipoprotein health and heart health and again asserted 'DHA Saves Lives' (1). Their claims statements are supported by the recent National Institutes of Health (NIH) article from June 12, 2016 (www.nih.gov) in Research Matters titled 'Omega-3s Linked with Lower Risk of Fatal Heart Attacks' (2), and the JAMA Internal Medicine research results published June 27, 2016 (3). The authoritative 2016 references affirm fatal heart disease is a literal endpoint benefited by DHA omega-3s and the other shorter forms of omega-3 fatty acids when consumed at elevated dietary intake levels over time. Source-Omega LLC is developer of Class 1 branded ingredient SOURCE OIL®, Chromista oil water extracted Schizochytrium sp. algae oil. 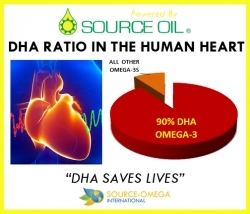 The company maintains public health advocacy and scholarly publications in support of the DHA ratio in human heart tissue, which is 90 percent of all omega-3 fatty acids in the heart. "DHA levels are ten-fold higher than any other omega-3 fatty acid in the human body. Individual omega-3 status is therefore based mostly on DHA levels, either consumed directly or derived from all other forms of omega-3s in the diet. Higher individual omega-3 status is linked to lower individual fatality by heart attack. So even if the world has not been able to stop all heart attacks, there is now specific evidence that shows a dietary buffer could be occurring with higher omega-3 intakes. The more omega-3 fats in the diet, the more DHA is produced and also stored in the body. Building up DHA is based on how much total omega-3s are in the diet. Clearly, it's more likely that one will survive an otherwise fatal heart attack. That is what the data says. We suggest DHA is the one lipid marker that may become more widely used as a standardized heart health indicator. It certainly can mean a statement like 'DHA saves lives' is scientifically qualified," said Dr Scott Doughman, PhD, CSO and CEO of Source-Omega, LLC. Source-Omega (http://www.source-omega.com) is the leading Chromista oil innovations company since 2007 serving health by offering a unique water extraction process in algae oil, lowering prices and improving quality. Preformed DHA has also been defined in Source-Omega's publications to be safe and effective for adults at 1200 mg DHA/day for lowering triglycerides (1). 1) Scott. D. Doughman, Ph.D. et al., 2013; High DHA dosage from algae oil improves postprandial hypertriglyceridemia and is safe for type-2 diabetics. Int J Diabetes Dev Ctries (DOI 10.1007/s13410-013-0125-3). 2) Carol Torgan, Ph.D. June 12, 2016; Omega-3s Linked with Lower Risk of Fatal Heart Attacks (https://www.nih.gov/news-events/nih-research-matters/omega-3s-linked-lower-risk-fatal-heart-attacks). 3) Liana C. Del Gobbo, Ph.D. et al., Published online June 27, 2016; ?-3 Polyunsaturated Fatty Acid Biomarkers and Coronary Heart Disease Pooling Project of 19 Cohort Studies. JAMA Internal Medicine. According to the researchers, the additional benefit from fish probably comes from omega-3 fatty acids. However, they note that even the nonvegetarian group in the study consumed less meat than the average American. With respect to algae oils, we consider the word "sustainability" in current food and fuel models. Overviews discussed are intended as general contexts for 1) the planet, for 2) finished oils, and for 3) growing new innovations. Part of the discussion considers trophic (nutrient) classifications. Heterotrophic algae systems may be defined as carbon-carbon bond consumers. Autotrophic algae systems may be defined as carbon-carbon bond producers, but are also consumers of their self-made carbon-carbon bonds to produce oil. All other organisms are also carbon consumers. Efficiency models for algae oils are also based on systems theory, but isolated data may suggest theoretical systems that need further proven. Because algae are inherently part of a "food chain" or an "economy" of scale, algae sciences increasingly have discovered paradigms for primary roles for algae in the discussion of "sustainability". New technologies for biomass, waste mitigation, and food and feed products require direct consumers over passive applications, such as fertilizer, due to the difference between direct and indirect consumption, especially with respect to the sustainability of water usage to produce oils. We suggest identification of a proven oil product and the direct consumer first be established in a stable system of production and consumption of materials prior to the ability to discuss sustainability criteria. The discussion applies to both heterotrophic algae systems and autotrophic algae systems. The source of the carbon is not relevant to our equation for carbon-carbon bond flow as a measure of sustainability with respect to oil, unless further qualified. We conclude algae oil sustainability is fundamentally based on a controlled measure of carbon-carbon bond flow compared to the direct use of the target oil product for food or fuel. Q. Can marine algae omega-3s provide the same benefits as fish oil ? There are two interesting points right off the bat. First is the consideration of algae as marine. Marine algae is a correct designation in general and with few exceptions. Second, the supplement model is the only method of educating about the science of fish oil and algae oil and fish as food, all are separate. Combined algae DHA supplements with food is needed. Combined EPA supplements with food is needed. There is really no difference between the two. I concluded and have published that after 6 months of any EPA or DHA or EPA+DHA combination with any biologic fatty acid therapy that these are identical in relative omega-3 index and omega-3 physiology outcome. The differences are far more meaningless than the similarities. No one formula is superior, although products may compete for best. DHA inherently is EPA and EPA is inherently DHA as needed once in the body. Don't discount you have a healthy powerful liver for metabolism. This article on the Tribune website is important. The basis of any omega-3 fat causing any change in LDL-C is a shared statistic. Stick the statistic in its place. It has a role. Why does this result happen, the LDL-C increase, a barely significant result and a barely significant point? Why, because consumed fat necessitates liver-VLDL budding, which is a particle that is processed into LDL-C particles: VLDL>>>Pre-LDL>>LDL-C>remnants. The metric for LDL-C has been standardized, just like the Omega-3 Index is becoming, but the LDL-C particle now is by law a disease marker. Since adding omega-3 oils adds to total fat intake on a daily basis, this could add up to 5% more fat consumed per day. This is a metabolic challenge and, perhaps if you also control total fat intake by offsetting 5% of any other fats in the diet, you now have a controlled state. This is basically what Amarin did. That is all. So that means most all other data has the risk of showing omega-3 benefits in preferential lowering of steady state blood fats and increasing steady state waste removal via HDL-C, but a tiny LDL-C change may be seen as (not) a side effect. Not in me. I want my LDL-C to go up if I eat more fat. Why does the doctor NOT want me to have a healthy fat metabolism? Does this not prove part of the high cholesterol problem is caused by the high fat problem in the blood (due to sugar and fat together) as a first indicator? In some people, not in all. But in general, high triglycerides will correlate with higher LDL-C.
First of all, consider me a full CSO and Regulatory QA/QC officer in operations and a CEO of Purity. For 5 years I have been seeking the holy grail of algae oil omega-3s and have emerged as Dr "DHA" Doughman. Everything comes down to one single concept here. Do YOU have the love it takes? Could YOU take a 99% pure DHA triglyceride oil and make something with it? I made DHAlicous(TM) and started researching how to develop this product for many different uses, now working on recipes. About half of product innovation is sparked by my customer's needs. You could also establish a ...founDHAtion...(TM) starting from our two ingredient DHA algae oil (DHA Chromista oil plus green tea antioxidants). Also, we have made many PURE ONE(R) babies over the years. I call the babies born to mothers and families taking it... PURE ONE(R) babies http://www.facebook.com/pages/Pure-One-Omega-3/162198434028. What to Buy Now!? Mother Nature. Ever wonder what food consumers worldwide really want? Natural purity. Good news, you are in luck. PURE ONE® uses the original water extraction technique to give 99% natural triglycerides for the purest DHA oil on the planet. Now we can assure the mother of our water extraction process and absolute purity. The analysis we did shows it exceeds all fish oil or other algae oil purity standards in the world.You can really save your life, live longer healthy and enjoy life, including foods and drinks all along the way. Can you win on purity? Is it superior? Well, if you don't think so you will end up loving another, have less peace of mind, less comfortable living conditions, loss of wireless, fear and pain. No, really! Maybe we should cap and trade purity, like we do pollution. Think about it, if we cap purity levels then I can sell purity credits to my competitors. I'm strategically going in the direction of supporting life, preventing death and promoting conception. I'm interested in focusing on ideas related to birthing, beauty and body wraps. WHAT IS A POWER OMEGA? A POWER OMEGA is an omega-3 fatty acid IN YOU found one order of magnitude more abundantly than any other omega-3 fat. That means there are several forms of omega-3 fats, but only one is found ten times higher in you as part of your distinctively human "omega-3 identity". The POWER OMEGA in you is DHA (docosahexaenoic acid). Your omega-3 identity is part of your omega-3 physiology. Different parts of your body are separated into different organs and tissues similarly non-identical in omega-3 composition, ratio or abundance of DHA. But this one omega-3, the DHA, is always found most abundant in every single part of you. Your omega-3 identity is defined. From the character of your red blood cells to the uniqueness of your organs, your individual DHA ratios are preset within each different part of you. But the range of total omega-3 levels in you will slowly build-up or go down in line with the DHA your system takes in. One conclusion is your DHA levels matter most. It mainly matters how much omega-3 you are getting. Secondary to the problem is what type of omega-3 you are getting. Your body is pre-programmed to use the omega 3s you consume on a daily basis. Your liver will reshuffle the omega-3 fats in order to fulfill a preset fat delivery function it exists to perform for the rest of the body. There is little any food or oil or drug can do to stop the liver from budding off droplets of fat filled during the hours after you eat, with or without an additional stick of butter added to your meal. Fortunately, the liver is a fat sponge that differentially uses, selects, pulls-out, picks-up DHA from liver membranes to form the budding fat droplets that traffic and transport fat out to the rest of the body. DHA is the fundamental omega-3 of that machinery in the liver that assembles the cargo packing material around the great balls of fat. This packing material is micelle-like; that is, it is a wrapper-like film on the surface of the fat ball. Like a shell. That shell has lots of DHA omega-3 in it, used by the liver to wrap fat. How this was learned is related to the scientific models of fat transport through the liver. Diving into the creation of these droplets is a mystery and a journey into science beyond the scope of this book. Several factors come together in the liver cell to make the great balls of fat inside special internal compartments. Think of budding fat droplets as packages going out through the mail. After wrapping, a stamp gets put on the package; it's the same case in the liver transport of fats. This is an example of reading into the detailed situation of what is happening to the omega-3 fats after you have eaten them. The liver controls and processes all the omega-3s. It re-bundles all of the omega-3s into a preset format, uses these for making fat packages ready to ship out. The liver is your first omega-3 processing organ. Other tissues are receivers of the shipments. At the other end of the package delivery, a cell will take in the package of fat by receptors. That means the cells see the stamp and swallows up the fat packet. After that the cell can incorporate the omega-3s into itself. Fat transport functions are detectable and improved by virtue of what happens first in the liver cells to make the great balls of fat. Even if you don't eat omega-3, DHA mediated processes are still taking place in the liver, because that is how the liver works. But it seems that the liver works better when it has higher levels of DHA and other omega-3s available to do its work. In fact, this is clearly part of a physiology that lowers blood fats called triglycerides and reduces fatty liver syndromes. That omega-3 physiology is tied to the power of omega-3 DHA. Your omega-3 identity is part of your blueprint. DHA always present much more abundantly than all other omega-3 fatty acids in every tissue and cell in your body is not the only surprise. About 15 percent of your blood omega-3s are something called omega-3 DPA (docosapentaenoic acid). DPA is something most people have never heard of, which points to a need to know more about DHA as well. Another important omega-3 fatty acid in the diet and the body is perhaps the most well-known. EPA (eicosapentaenoic acid) makes up about 5-10 percent of the omega-3s in you. DHA, the POWER OMEGA, is also the longest chain fat that directly improves total blood fat levels. This in turn improves your health, but what you need to know is that when it comes down to eating your omega-3 fats, you are NOT at all what you eat. The input of food and type of omega-3 does not define your primary omega-3 identity, your liver does. Unlike alcohol that is removed by the liver, omega-3s are saved by the liver. Unlike amino acids that get absorbed by your cells while in the blood, fats don't absorb into you until they are deposited into the liver first for processing and shipment. Unlike sugar, which is rapidly spiked into the blood within minutes and hours, omega-3 fatty acids slowly travel through the system over hours, days, weeks and months. Fat is different in how it moves around in your body, it is tightly controlled and largely independent of other systems' direct control, although integrated with those other systems. What are people asking online and on calls? Now it seems everybody has heard about omega-3 as an important way to improve your quality of life, so people ask if there are lots of omega-3 sources to choose from, isn't all omega-3 the same? Not anymore! Introducing DHA algae oil as a power food! This means you get the first optimized omega-3 dietary oil developed from a pure culture, not harvested or caught. Even if other omega-3s are also good for you, DHA could be the best for you to get in the diet directly. What if you could get your POWER OMEGA directly? Now you can. Algae are the unique Kingdom of Life that makes DHA directly as an organism. It has since been found that the DHA in algae oil will help give nutrition, structure and function to your liver, heart, eyes and brain. Does that mean you are taking a brilliant leap forward in omega-3 fatty acids with DHA algae oil? Yes! Fish and flax oil require a majority of what is taken to be modified by the liver before use by the body. Derived from algae, DHA algae oil is different from ordinary fish oil because it eliminates the possibility of mercury and other contaminants. DHA algae oil boosts your intake of DHA, the clinically supported nutrient associated with cognitive health and liver function. DHA algae oil gives you a more scientifically perfect omega-3 balance directly used first by the liver for lowering your blood fats and for giving you the EPA you want for your heart by keeping or making the DHA you need. DHA can be made by your body from fish oil and flax oil, but these are low DHA suppliers and require internal processing in the liver, plus these are not where DHA comes from in nature. Without direct DHA intake you could be at higher risk. Fish oil is a good substitute, but DHA algae oil is a truly great addition, especially if taking only flax oil. What can the POWER OMEGA do for you? So what do you need to know? The omega-3s are good fats needed more than ever to ensure your quality of life. So you need to know that DHA from algae oil has the highest natural DHA level known on Earth for providing you the POWER OMEGA your body uses most. After years of research at leading universities I'm convinced DHA algae oil is the most effective and sustainable way to get the benefits of omega-3 in a way that will help keep you metabolically healthy so you can live longer healthy. In fact, the science suggests DHA is critical to keep you metabolically healthy regardless of your weight. This means DHA is also a power food that saves lives. When you put more omega-3 fats into the diet the more DHA is made in the liver, this leads to less total fat build up in the blood to help keep you metabolically healthy. Metabolic health is defined as normal levels of blood fats such as the good and bad cholesterol, total cholesterol and your triglyceride levels. Recent studies of persons who were obese supported the theory of a reduced risk of dying by up to 40 percent from obesity if metabolically healthy compared to persons who were obese and metabolically unhealthy. You live a certain lifestyle, besides your weight, be honest, are you metabolically healthy? It may not be the calories only, rather the choice of lifestyle and foods. It is truly simple; the steady state of being metabolically healthy is linked to the sturdy art of normal living, plus the DHA levels in you. Right now, at this very moment, how is your fat health? Not your weight, your blood fat levels. These are also called your plasma lipids. Like your blood pressure has a normal range, so too blood fats have a normal range. Separate from your weight, you can control your blood fats to increasingly become metabolically healthy. At high levels DHA in particular, plus other omega-3 fatty acids, could cut almost half the risk of dying from all causes when combined with normal diet and exercise. Not all studies will agree, yet most will give some measure of reduced risk. My role is to inform you of the range of possibilities. Of course you may choose to do nothing, but medical doctors, FDA officials, Sports Umpires, Republicans and Democrats will often themselves be consumers of omega-3 supplements. Could this book help you learn how to live longer healthy? Could this book help save lives? Indeed, omega-3 fats will help save you from yourself becoming metabolically unhealthy. Could this add an average three years to your lifespan? Yes it can when used for the long-term. You can now call DHA algae oil the next generation omega-3 and the next generation plant-based omega-3. Now you know, in order to work, the liver particularly uses the omega-3 called DHA. This all seems to say that DHA in the liver is the POWER OMEGA, DHA SAVES LIVES and you can live longer healthy. The copyright to this work is retained by Scott Doughman for the education of Algae Oil DHA effective July 2nd, 2012.